Have an old bicycle laying around? 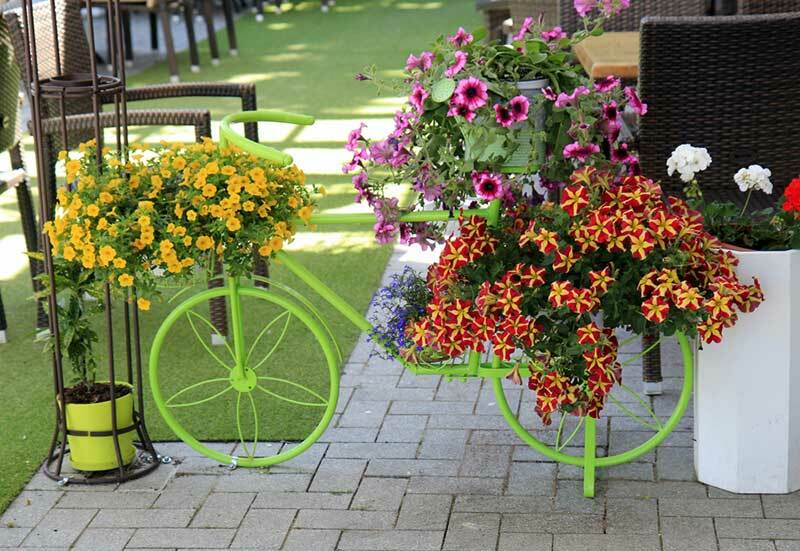 Here are some Bicycle Planter Ideas you can create and add to your yard or garden. 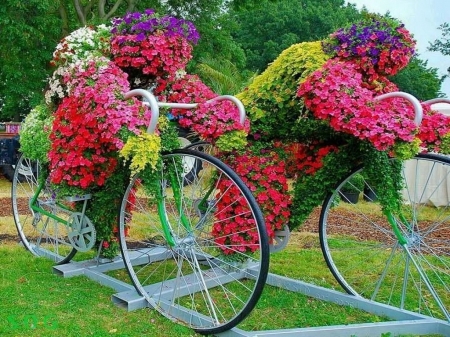 Vintage bicycles can be transformed into the coolest art, and can dress up your garden. 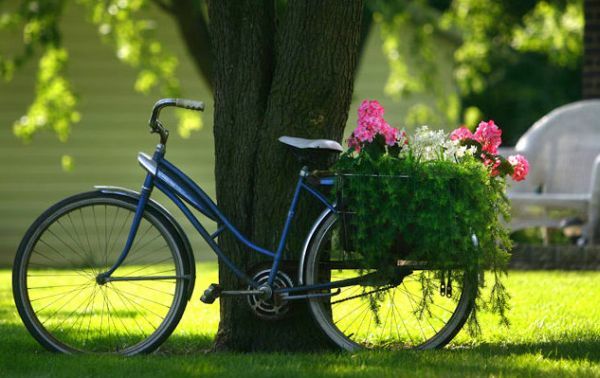 Adding decorative glass to the spokes, or baskets filled with fragrant, brightly colored blooms look great whether they’re in your backyard or are being used for a more commercial purpose, like the bicycle above. We’ve scoured the Internet to find a wide variety of clever ways to turn an old bicycle into a permanent display, or even to turn your current bike into a rolling garden. Some of these designs focus on store-bought bicycle-shaped planters, while others are made from vintage bicycles, or even bicycles that children have grown out of. There are many unique designs to choose from. 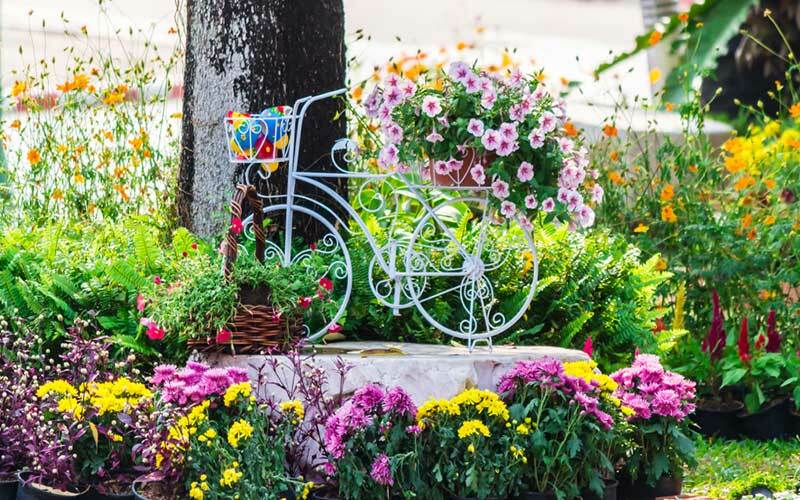 So whether you choose to DIY a new life for an old favorite bicycle, or purchase a bicycle-shaped planter that’s ready to be filled with your favorite flowers, you’re sure to find a design that piques your interest. 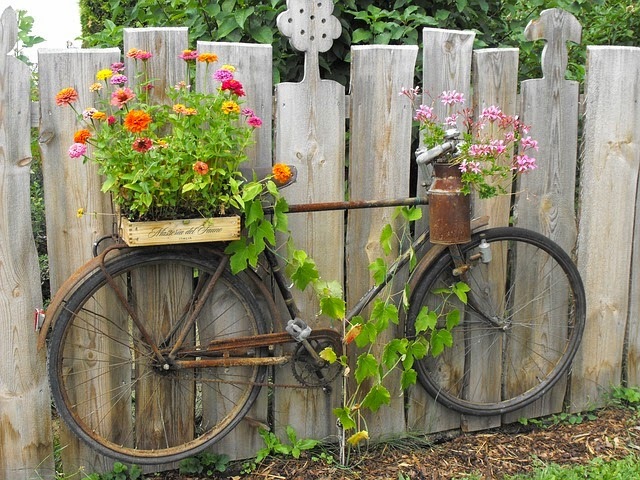 We hope you’ll be inspired to upcycle your old bicycle! 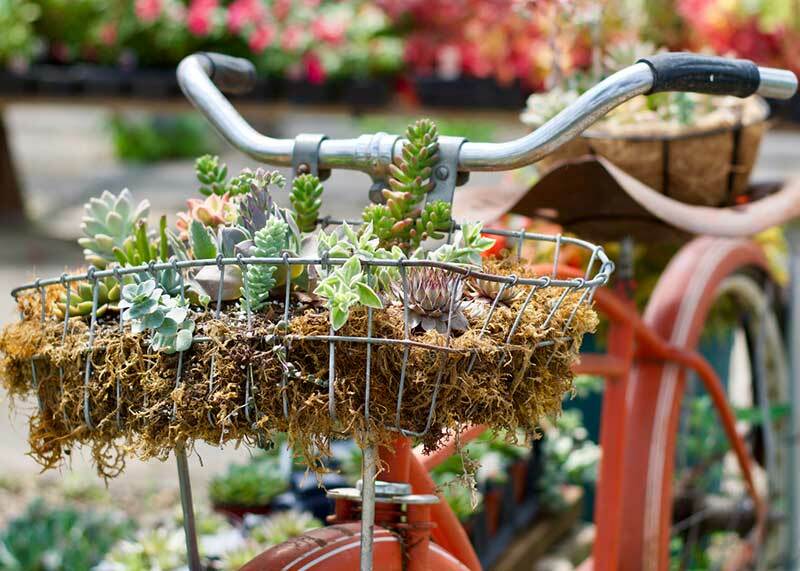 These itty-bitty succulents can go with you wherever you go, as they attach to your current bike. This is an unconventional, but great way to personalize your ride. Take your flora-friends on a spin! These miniature planters attach to any portion of your bike, but we’d advise putting them on the frame, where they’ll look great but not get in the way of your exercise. Plus, succulents are one of the sturdiest plants around! 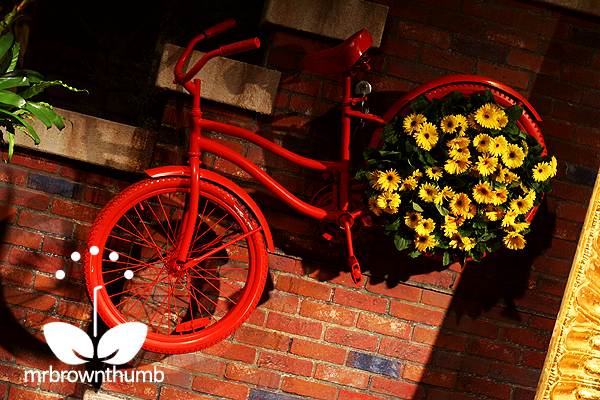 If you have a really green thumb, you might try taming a bicycle planter into the shape of a bicyclist. This might take more effort, but the effect is unparalleled. Each section of the humanoid figure is colored by a different flower, including purple for the hair and green for the clothing! The effect is utterly stunning. 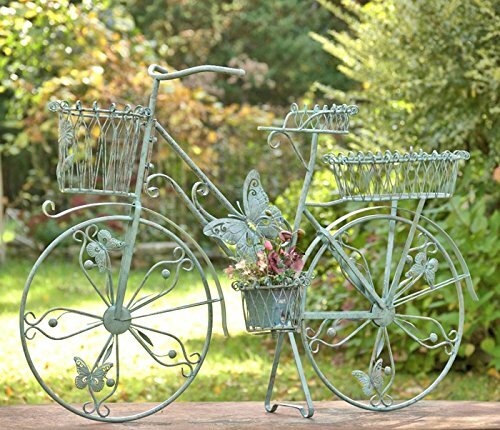 While this tricycle was never meant to be ridden, it does make for a charming display piece, with three spots for planters of different sizes. The lightweight frame also allows you to simply pick up and move the planter, even though the wheels don’t actually turn. The embellished baskets perk up the plain terracotta planters. 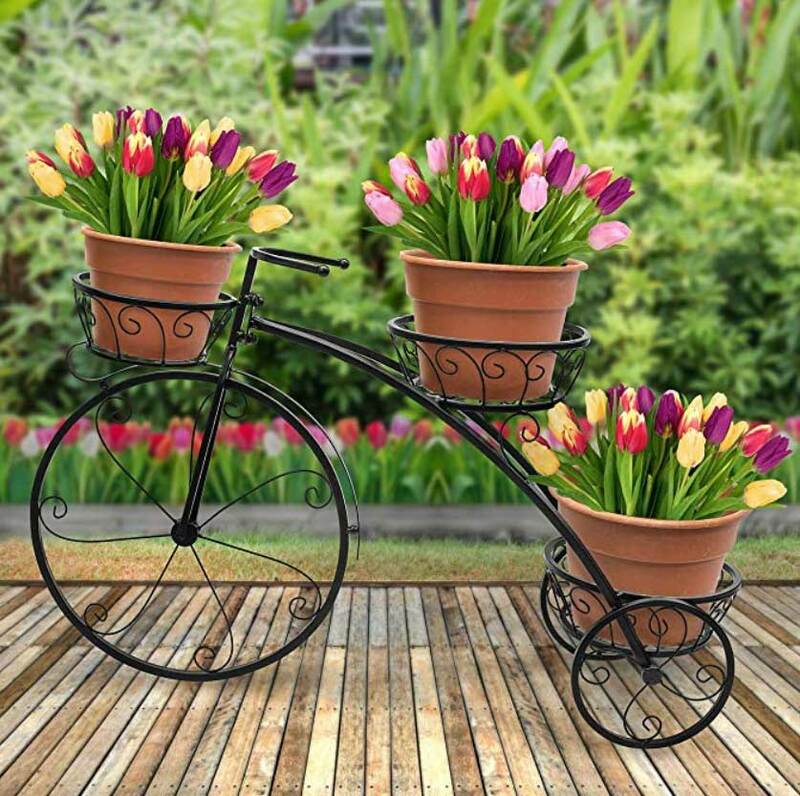 This tricycle planter is available on Amazon. 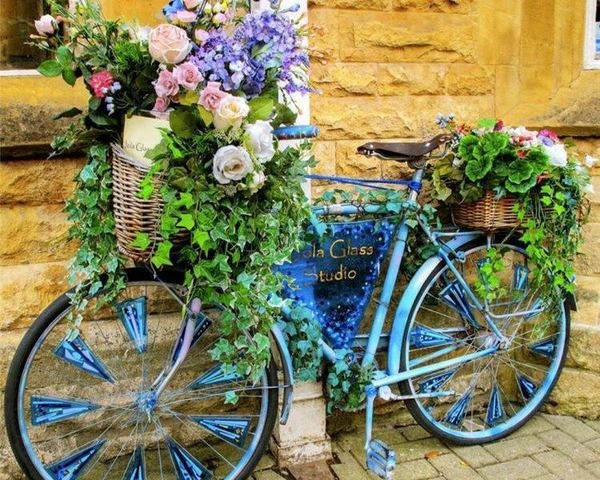 A simple vintage bicycle can be transformed into a work of art just with flowers, but this glass studio took it to the next level by adding glass pieces to the spokes. The baskets are filled with a variety of greenery, including ivy, but also with lightly colored flowers like roses. 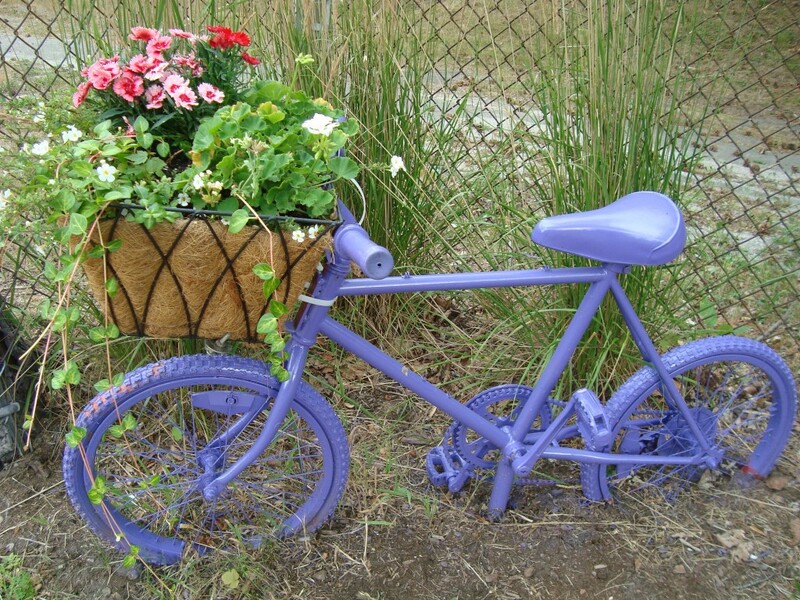 The taller lavender flowers pull blue from the ombre bike frame. 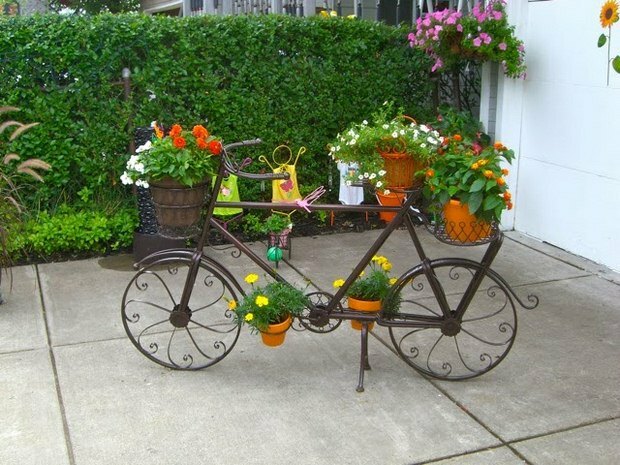 This full-sized wrought iron planter has two baskets to hold your planters, and a third planter can be set on the bicycle seat. The textured wheel guards add visual interest to the piece, along with the heart-shaped spokes. Magenta petunias and firey yellow-orange flowers on the seat complement the brick facade of the home. This vintage bike is still in good working order, so you can take the planter in the back for a spin if you so desire. Ivy drapes out of the basket below the bright pink and soft cream flowers, nearly reaching the ground. Against these colors, the metallic blue frame of the bicycle is stunning, as is the contrasting white seat. Wherever you decide to go, the fragrance of your flower display will be right along side you. This vintage bicycle was given a fresh coat of paint. Bright yellow flowers were planted on the rear wheel. The entire contraption was hung along a set of brick stairs. In this way, the bicycle becomes a vertical garden, utterly unique. Painting the bike a singular color allows the bright yellow flowers to contrast sharply and draw the eye. 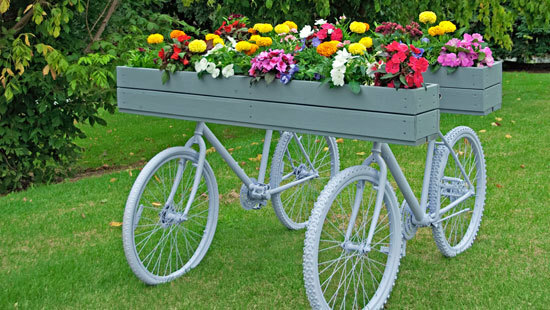 A set of bicycles are painted white, with the top half removed to make room for two long planter boxes in a dusky blue. As you can see, the bikes don’t necessarily have to match. You can use any bike to create these displays. this unique garden planter can’t be separated, making it a sizable addition to any garden’s design. In addition to placing a planter both in front and behind the bike in baskets, a planter is added to the seat, and to both of the pedals. Kickstands on either side of the frame ensure that your display won’t topple over. However, this piece is better on a solid patio, since the feet of the kickstands are narrow enough to push into the soil. The rear of this bike is inset into the ground to keep it from falling over in the breeze since it lacks a kick-stand. The enormous basket on the front contains a variety of flowers. The oversized basket is filled with natural, absorbent fibers that will keep the soil from simply falling out from between the wires of the basket. The bold purple paint color makes a bold statement. 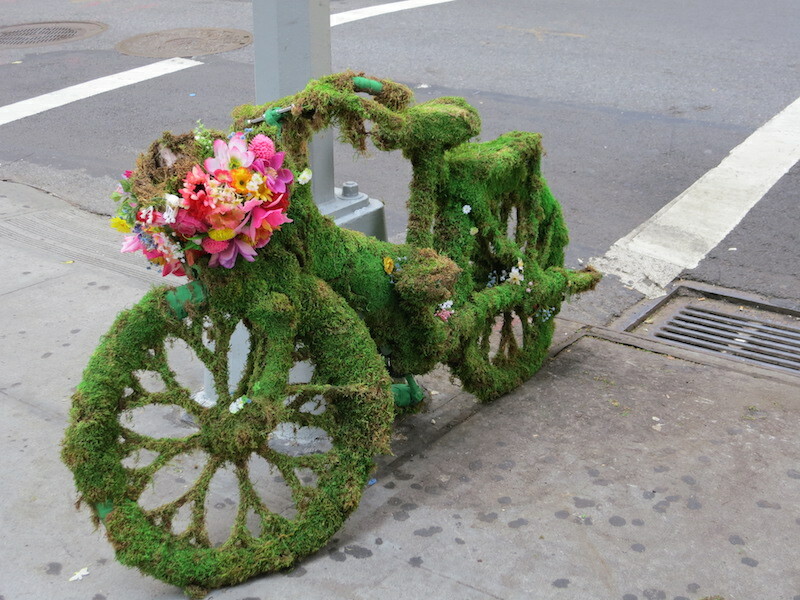 This abandoned bike was transformed into a living work of art, completely overgrown with moss and crowned with exotic pink blooms. It’s remarkable to see how man-made objects can utterly be taken over by nature, retaining their unique, recognizable shape, but still changing forever. That this piece is located on a busy city street only enhances this quality. This weather-worn bike is attached to the fence and has ivy growing up the sides. On the back is a planter box fashioned from an old crate, while the planter on the front is in an old milk can. Suspending the bicycle from the fence keeps it from tipping over and spilling the delicate flowers. Also of note are the carved fence posts, which add another quirky element to this display. The flowers in this bike’s planters are growing so wildly, the top half of the bike has almost disappeared, leaving the tires mostly visible. This display is still mobile, so it can easily be moved indoors in the event on inclement weather. The bright flowers and vines make a bold statement by the windows of this shop on a city street. 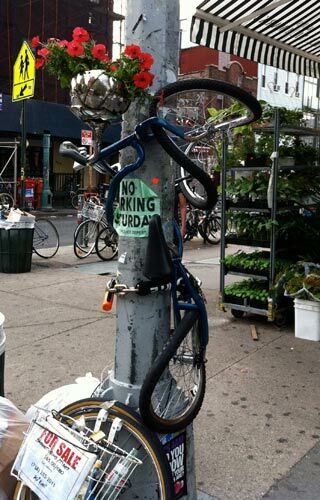 An artist twisted this bike around a pole and attached a single planter to the top, creating a unique work of urban art. The bright red petunias rest inside a metallic bowl that is attached to the frame of the twisted, mangled bicycle frame. The contrast between the delicate flowers and the thick, industrial pole is remarkable. Each of these bikes has a small plant attached to it, creating a row of lovely displays along this sidewalk. Each bicycle is locked in place by pads attached to the front and rear wheels, ensuring that the display won’t be disrupted by wind or weather. 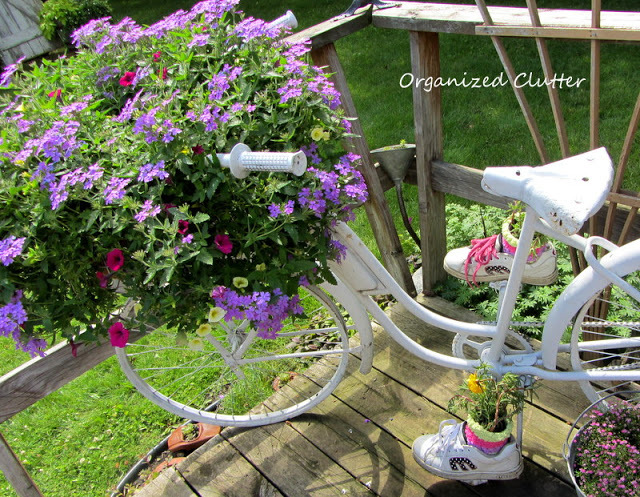 In addition to the overflowing bike basket, this adorable planter has tennis shoes turned into planters with colorful socks. It’s almost as though a small invisible child were riding this painted, bright white bike. It’s a great way to make use of a pair of favorite shoes that have been outgrown, along with a pair of socks that might have a hole in them. The lavender flowers have small, numerous blooms. An old mountain bike gets new life with a simple rustic wooden planter attached to the front. While this bike might be out of commission, the contrast between the metal frame and wooden planter box ensures that it will continue to have new life grown into it, and even now, makes a great display piece for any backyard garden. 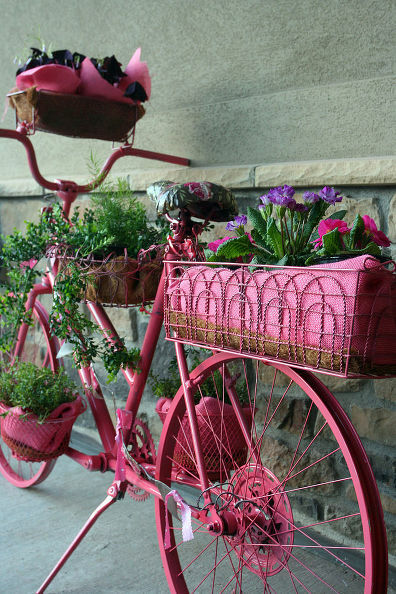 This bike was painted all pink, then fitted with a number of baskets, creating a bold display for a garden or front walkway. The leather bicycle seat is painted with depictions of flowers as well. Pink textured fabrics line the inside of each basket, leaving a line of light brown natural fiber liner visible at the very bottom. 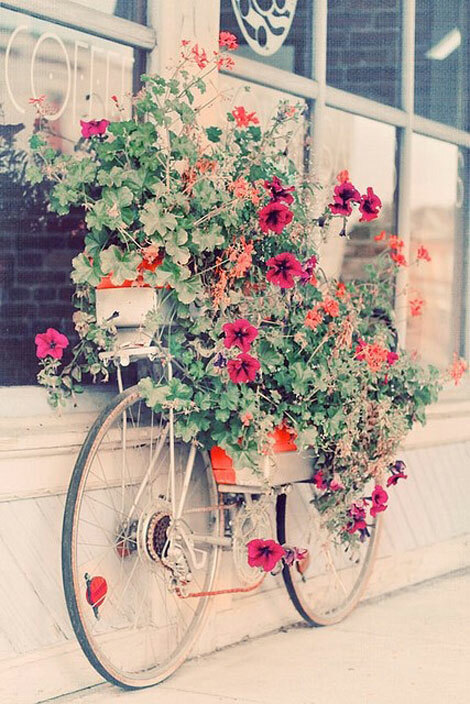 This feminine display is a perfect way to transform an old, well-loved bicycle. This bicycle planter is one that looks like it is parked because the back wheel is in a stand. It is a bright white bike that has a lot of flair around the pedals and the handlebars. 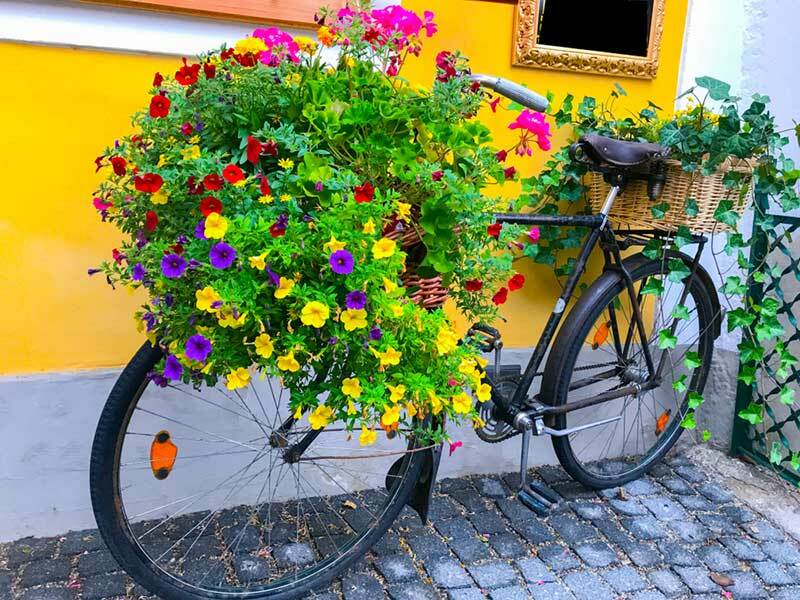 There are also two baskets on this bike that are ideal for placing brightly colored flowers like the pink and yellow ones seen here. 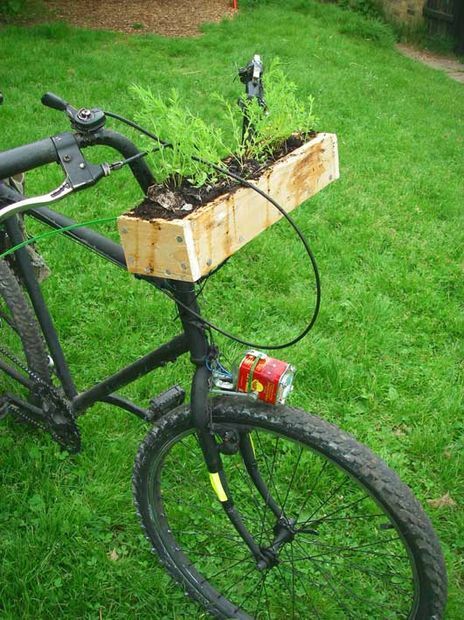 This planter is designed like an older bike that has been used quite a bit. 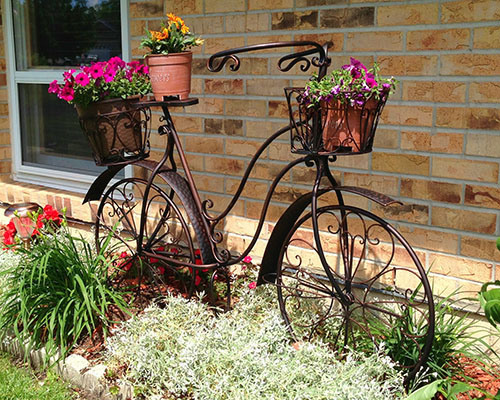 The grips on the handlebars are worn a bit, and the basket on the front of the bike is bent and rusted, which makes it a great planter to use when you are looking for something to decorate your garden in the fall. In this photo, a variety of succulents are planted in the basket. 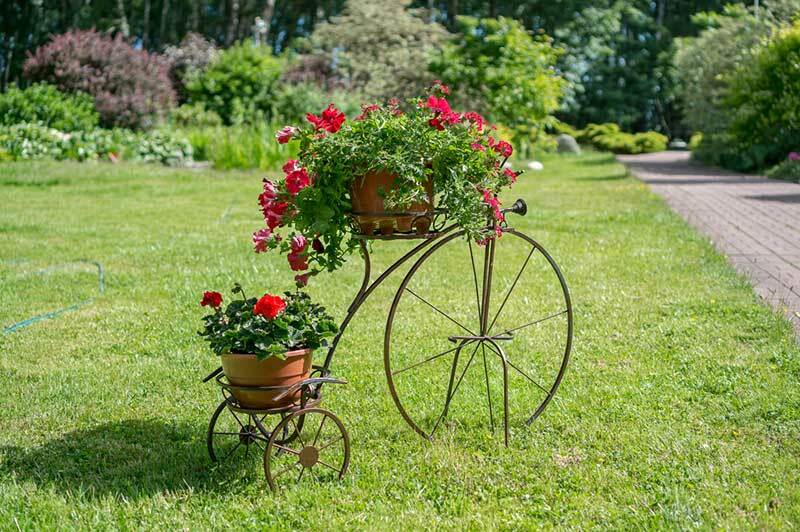 This bronze tricycle is the perfect planter for plants that have long flowering vines because as the plants bloom and grow, you can wind the plant through the spokes of the bike. There are two places on this planter that will secure your plant, and the tricycle even has a horn on the front. This is a bicycle that has eight planters that are located across the orange, yellow, and black bicycle. The seat has been removed and replaced with a planter that is shaped like a watering can. 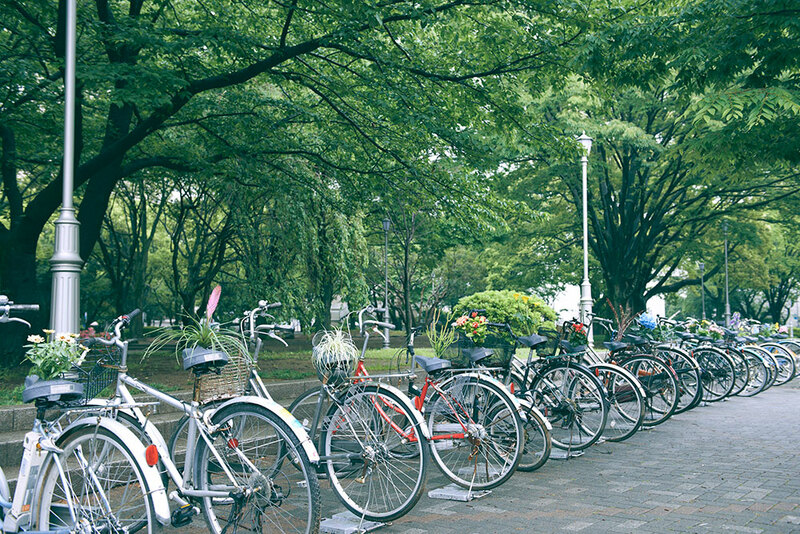 The pedals have been converted into small planters, and there are more planters surrounding both the back and front wheel. 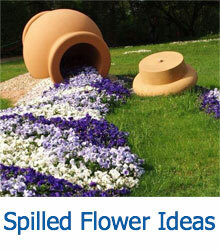 Since this is a planter that is bright in coloration, it will be a great addition to any patio or garden. 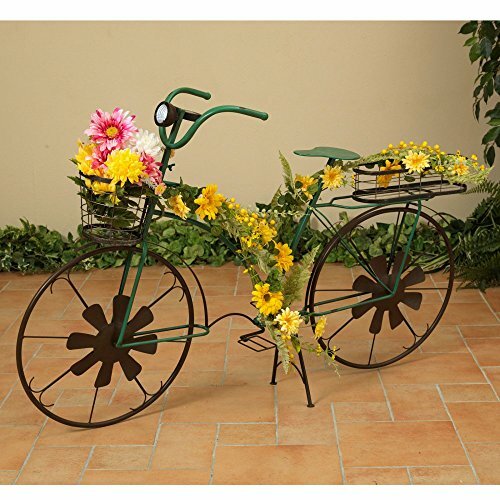 The four different places that you can place plants on this bicycle are perfect locations to create a colorful display like the one seen here, and if you choose plants with longer flowering vines, you can twist them through the spokes with ease. 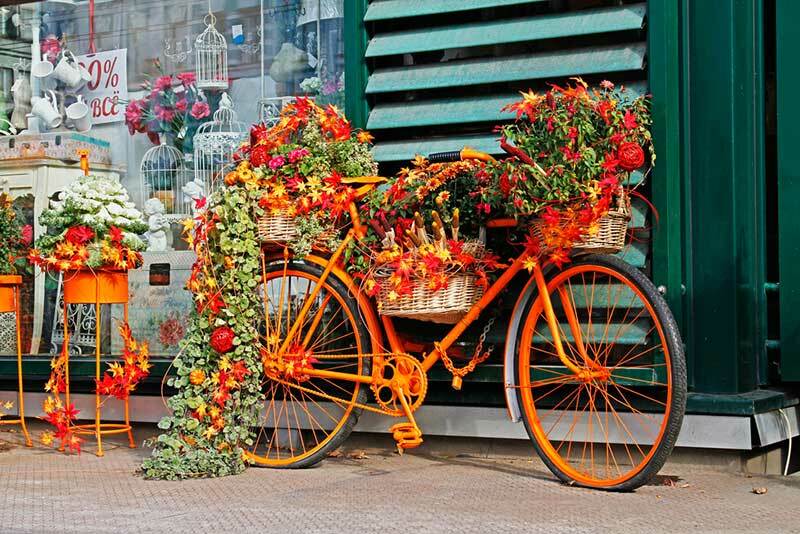 This bicycle looks like it was chained to this storefront years ago, but the bright, vibrant orange coloration of the bike has made it a permanent fixture that looks great with orange flowers and plants with long green vines. The baskets that the flowers are positioned in really look great against the orange. 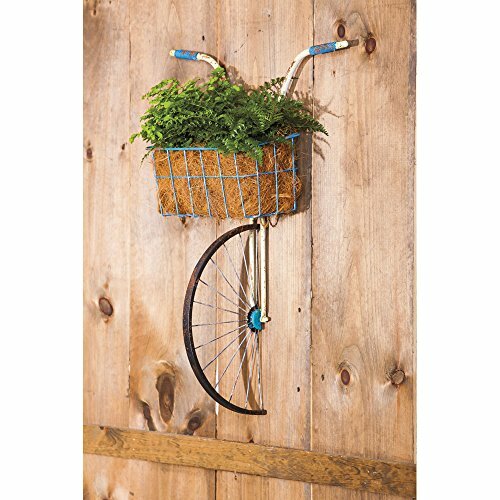 If you have an area in your garden that is against a bright wall, then this bicycle planter will provide great contrast to the area. 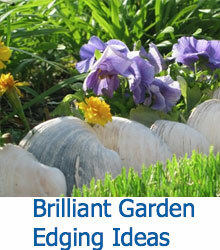 Planting bright flowers, like the ones seen here, will likely attract butterflies and other pollinators. Ivy and plants that can be trained will look great in this planter. This bicycle looks excellent in this garden because it adds some contrast to all of the green. 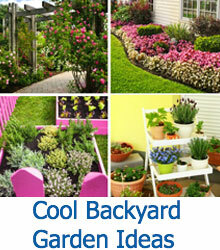 It is also positioned on a cement slab, which adds height to the garden without the use of tall plants and bushes. 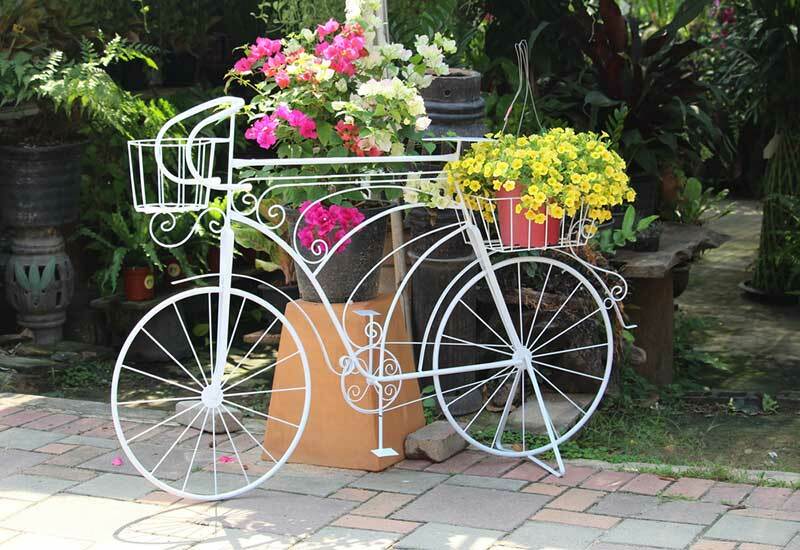 The intricate spokes that are on this bicycle also help to make it the centerpiece of this garden. 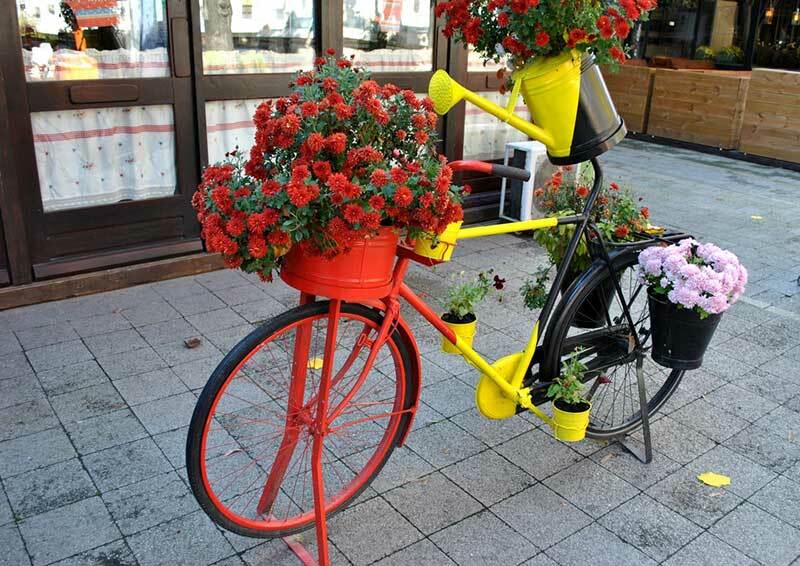 Don’t have an old bike laying around that you want to turn into a planter. Amazon has a couple of these already set up as planters. Here a few listed below. All of the plants that you see here are shades of green, which helps to highlight the rustic look of this bicycle planter. The medallion that is on the wall behind the planter is quite intricate, and the spokes and the bases for the plants match the unique design. As you can see, this is the ideal planter for a spider plant. 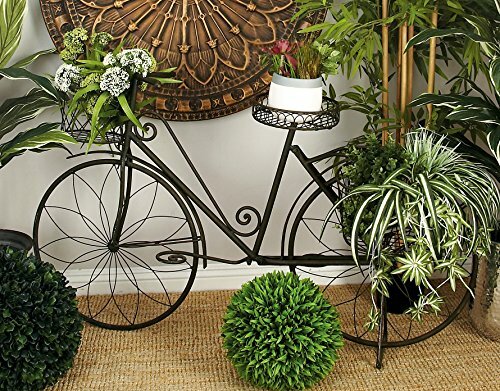 The main part of this bicycle planter is dark green, so it will look great in any garden. The wheels, the unique spokes, and the baskets are bronze, so if you fill the planters with bright blooming plants, you will create a lovely contrast like the one seen here. This bike also comes with a solar powered light. Iron that has been outside for a while often takes on a green coloration, and this bicycle planter is no different. 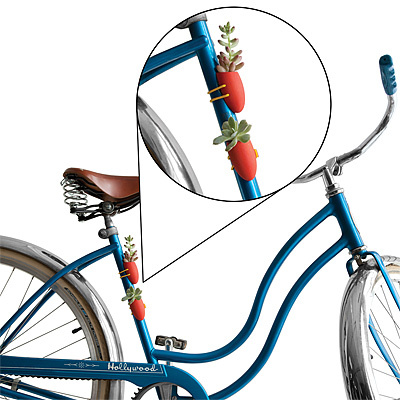 There are places to keep your plants near the handlebars, the pedals, and the seat of the bike, and the spokes have a unique look that is decorated with butterflies.